Earlier this fall, JP and I embarked on our annual trip to New York City, where I grew up and where my Mom still lives. Normally on these visits, we are content to plot and rehash the day’s adventures by pouring over the vibrant illustrations in Kathy Jakobsen’s My New York, which my Mom brings down from a closet upon our arrival. This time, I decided that some advance reading was in order. So, in the weeks leading up to our departure, I read to JP one of the novels I most remember from my childhood: E.L. Konigsburg’s From the Mixed-Up Files of Mrs. Basil E. Frankweiler (Ages 9-12; younger if reading aloud), which won the Newberry Medal in 1968. 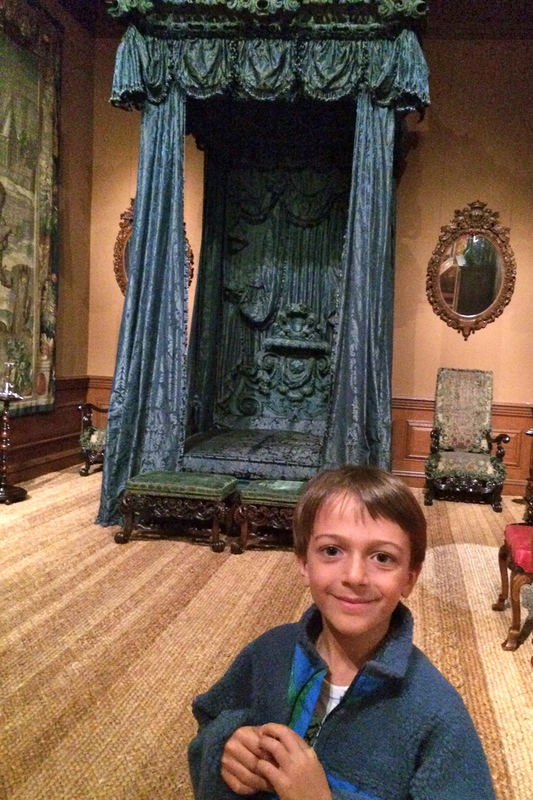 Through the eyes of two runaway siblings from Greenwich, Connecticut, who secretly live (and sleep) in The Metropolitan Museum of Art for an entire week, we are introduced to this incredible museum with drama and intrigue. 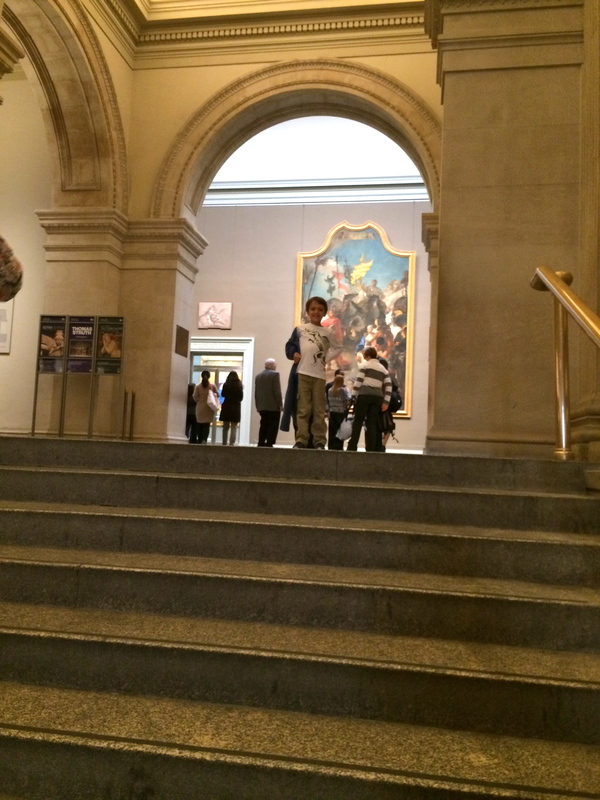 The last time I took JP to the Met—albeit he was only five—was a disheartening disaster; he was bored within minutes of my ramblings about Impressionist painters. This time was different. This time, we had purpose: we were following in the steps of Claudia and Jamie Kincaid. During the train ride up to New York, JP and I discussed with excitement: what things from the book did we want to see? The Fountain of the Muses where the kids took their nightly baths and pocketed pennies! The lavish sixteenth-century canopied bed in which they slept! 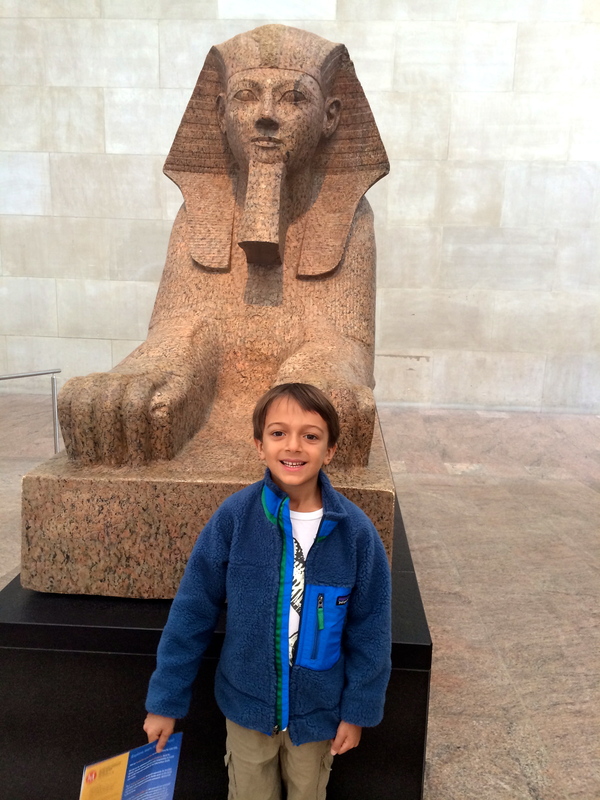 The Egyptian tomb into which Jamie ducked when he saw his third-grade class on a field trip! Top of the list—and at the center of the mystery that Claudia and Jamie seek to solve in the book—was the Italian Renaissance statue titled Angel, a piece which may or may not have been crafted by the great Michelangelo. And then I did a Google search on my phone—assuming that we were not the first to do a Konigsburg-inspired tour of the Met—and quickly realized that not a single thing on our list was still on exhibit. Many of them—Angel included—had never been there in the first place. “What do you mean it’s all made up?” JP wailed. But all was not lost. In a world where most chapter books for middle-grade readers bemoan school as a place to be avoided at all costs, Konigsburg’s is a story that celebrates learning on every page. 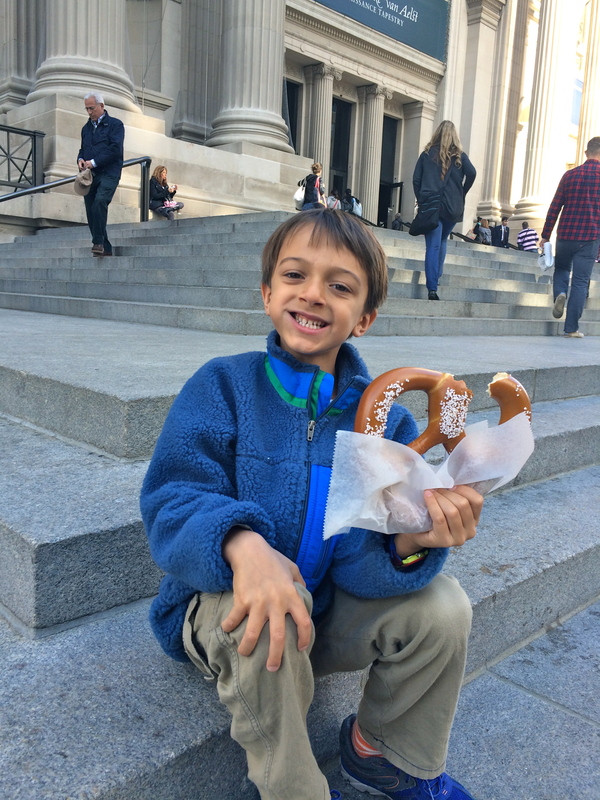 OK, so the kids aren’t exactly in school, but they are obsessed—they cannot get enough of—nosing around the halls of the museum, reading inscriptions, and taking side trips to the library to fill in gaps with research. I’m not talking strictly academic learning either: they have to experiment with how to manage their meager sum of allowances; how to keep up necessary rituals of self-care; and, as runaways, how to remain off the radar of security guards. We stood on the very spot—atop the great marble staircase—where Angel had been on display in the story. We talked about where the mobs of people would have queued to view the sculpture and how eerily quiet and dark it must have been when just Claudia and Jamie were standing there at night. Of course, all that made us hungry and we had to take a detour outside to purchase a soft pretzel from one of the many food carts in front of the Met (after all, Claudia and Jamie left the museum to find their food, too). We spent the most amount of time in the Ancient Egypt rooms and found many similar hieroglyph-filled tombs to the one in which Jamie hid. The star attraction, though, was out of a different children’s book, another that we had read in anticipation of our trip: Jessie Hartland’s How the Sphinx Got to the Museum. JP was the first to spot Pharaoh Hatshepsut’s sphinx, the very one that was unearthed by archaeologists in the 1920s (3,000 years after it was first sculpted), transported from Egypt to New York, and reconstructed at the Metropolitan—all as described in this fascinating and whimsical picture book. What began as an intent to see the things we had read about, turned into a launch pad to new discoveries. At JP’s insistence, we spent ten minutes admiring hand-enameled German and French rifles from the 13th century. I returned the favor by dragging him to the 19th century European paintings, where this time he listened as I talked about pointillism and painting the effects of light on haystacks. At the two hour mark, we were both done, and we celebrated with a trip to the Met’s spectacular children’s gift shop, where JP chose a book on Michelangelo. I know that we will read From the Mixed-Up Files again in years to come. At seven, JP can’t yet appreciate the emotional complexities of an ambitious, stubborn, brave, confused, and at times insufferably self-centered heroine searching for her place in the world. For now, I am just rejoicing that children’s books once again gave me an invaluable gift as a parent: the chance to experience the joy of learning alongside my child. A few days after our morning at the Met, JP and I rode the train home. It was a much different ride than earlier, when we had been chatting and planning. Mostly, we rode in silence, watching the newly colored trees fly by the window, JP’s head on my shoulder. I can’t speak for him, but I can tell you that I felt every bit of what we had done and seen and learned swelling up inside me. My brain and my heart were absolutely bursting with wonder and joy. What a beautiful account of your adventure! One of my favorite parts of your blog is that you remind me that I get to read some of my childhood favorites again (like this one!!) when I read them to the kids. Thanks! Thanks! We also just finished reading Roald Dahl’s The Witches. Remember that? It might be one of my favorite read-aloud chapter books of all time. A glorious adventure for both of you, beautifully lived and written about! You are currently reading Morning at The Met (Courtesy of E.L. Konigsburg) at What to Read to Your Kids.